This week I was going through some faith testing, as I have been looking for the right place for my family and me to settle down at. I was also being stretched in my faith to do some things I have not done before. I thought I could either stay in my little comfortable box of what I’m used to. Or move forward to a greater level to which I have not done before to get to a level of where God wants me to be. What kept coming to me was the story of the (“Wall of Jericho”)Israelites in the area of their life when they were transitioning from the desert to the promise land and their came a point when the Manna stopped, a point where God lead them to go after their promise. They were directed to the promise land, but instructed to go after it. They had to do something different to what they were accustomed to in order for them to get their promise. One was Walking around a wall for 7 days and then shouting before the walls came down, another was circumcision to which was unpleasant at the time to go through, while yet another was getting their food a different way because the manna stopped for them and this was all done before they got their first portion promise. They began to do things differently. I realized that in my own circumstances, I was still walking in an old mind set. From the way I was handling this move to the upgrade of this move. I could hear the Lord say, I’m doing a shaking, shaking out the old to make room for the new. I’m moving to a place to which is already upgraded from where I live now, to also the way I handle what God gives me in my hands to work with. · Today I finally got it. In Order to enter my promise land, I need to let go of old mind set and old ways of doing things. To go somewhere where I haven't been, I need to do something I haven't done before. The Israelites had to go after their promise land and Start planting crops for food because the Manna was not being served anymore, yet they prospered. They went after their promise and changed their mind set. I’m going after my promise. And I’m more excited about the rest of this year and years to come because I stepped out to do something out of my comfort zone. This place that I am in now, allows me to see how much bigger God truly is. He is my El Shaddai..
God who is able to pour out His promises of provision and power in abundance. 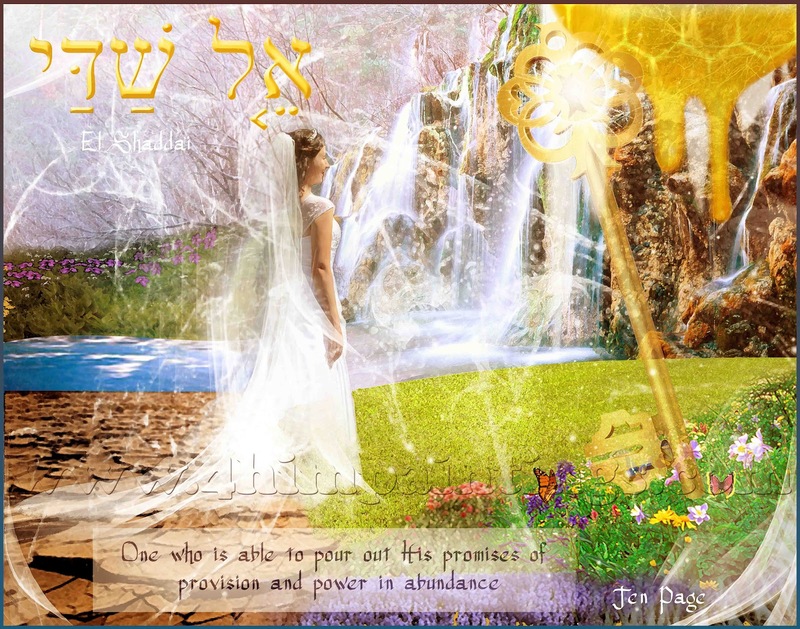 As this Bride enters in, she is not worried, despaired or impoverished. She is not held down by the world's economy because she recognizes that she is a daughter of the most High God who has promised to take care of her. According to his riches and glory in Christ Jesus. God is more than a provider; He is the God of abundance. Come and enter in to your promise land.